The life inside your reef aquarium is constantly using up the calcium in your tank water. 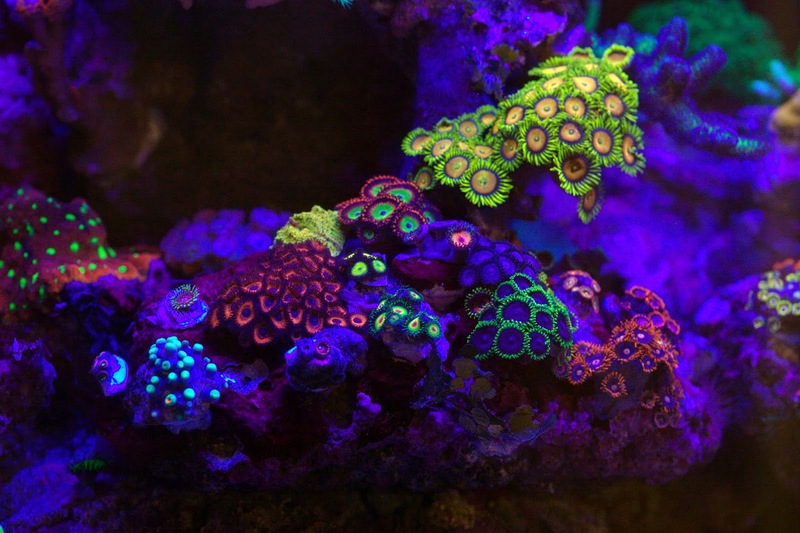 The rate of uptake varies from tank to tank—calcium usage largely depends upon the type of corals you keep in your aquarium. Reef tanks that are predominantly filled with hard corals—like Acropora, Montipora and Euphyllia, for example—will have a much greater calcium demand than an aquarium filled with soft corals, such as leathers, mushrooms and xenia. Fortunately, there are a few different ways we can replenish the calcium levels in a reef tank. One popular approach is by dosing kalkwasser (or simply “kalk”). We receive a lot of questions from hobbyists curious about kalk, so we put together a list of the most frequently asked questions to answer your inquiries and help you decide if using kalkwasser is right for you! Calcium hydroxide—Ca(OH)2—is sold in a powdered form for aquarium use. Most of the top supplement manufacturers produce and package their own versions of kalk (you can check out reviews on our website). The purpose of dosing kalkwasser is to maintain optimal calcium and alkalinity levels in a reef aquarium. To dose kalkwasswer, you must first mix the kalk powder with freshwater. This produces a clear liquid with some white residue leftover on the bottom of the mixing container. 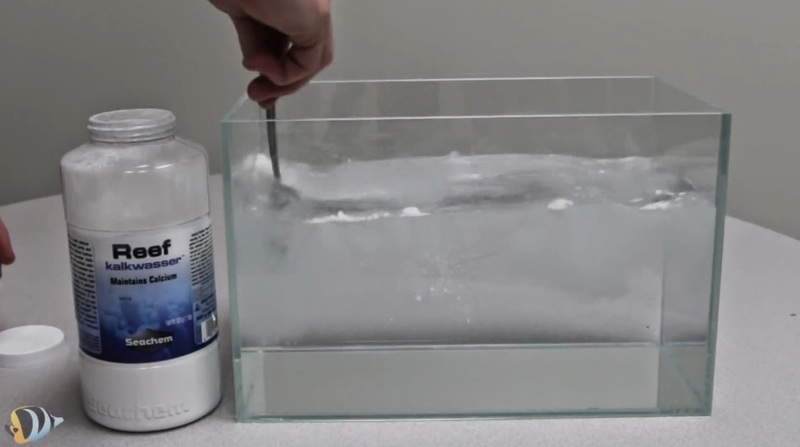 You can then dose/drip the clear kalk solution into your aquarium to help maintain calcium and alkalinity levels. 2. Should I use 2-part supplements, a calcium reactor or kalk to maintain levels in my tank? There isn’t a right or wrong answer to this question because every aquarium and tank owner are different. Kalkwasser is certainly an economical and easy-to-use solution: you can manually dose it, have it delivered via dosing pump or use a kalk reactor, each of which have different price points. 3. Can I use kalkwasser and a calcium reactor at the same time? Without a doubt, yes. If your calcium reactor is having difficulty keeping up with the demands of the calcium consumers in your aquarium, dosing kalk can pick up the slack. Experiment with stronger and weaker kalk mixes so you can dial in the best dosing regimen for your tank to keep levels stable. 4. How do I dose kalkwasser? Is one approach better than another? Here are another couple of questions that don’t really have a right or wrong answer. First and foremost, kalkwasser needs to be dosed slowly. Kalk has very high pH: if too much is added at once, you may raise the pH of your aquarium water to dangerous levels. If you manually dose kalk, I suggest using ¼” tubing (like airline tubing) along with a valve to dial in a slow drip rate. You can siphon the kalk from the holding container into your sump or other area of high flow in the tank to quickly dissipate the mix within the aquarium. Another method is using a dosing pump (like an Aqua-Lifter) to drip the mixture in to your sump. Since you aren’t relying on gravity to drip the kalk, the reservoir can be at the same level as the sump. There are also kalk reactors available that can be used with auto top off systems or dosing pumps to help with dosing. A kalkwasser reactor is simply an inline chamber that stirs the kalkwasser solution automatically ensuring maximum concentration. You can easily connect these reactors inline with your automatic top-off or electronic dosing system. READ The AutoAqua Smart ATO Micro with a DIY Twist! 5. Why should I dose kalk at night? In a reef aquarium, you often see a swing in pH levels from day to night. pH levels are highest during the day and lowest at night. Dosing kalk at night helps you keep pH more stable. Does this mean it is bad to dose during the day? Not necessarily. You can dose kalk during the daytime but you will want to make sure the amount being dosed doesn’t cause the pH to rise too high. 6. How long after I mix up my kalk powder with freshwater can I use it in my tank? This will vary depending how much you mix, but you will see a clear liquid within a couple of hours that is ready to be used. 7. Can I reuse leftover undissolved kalk powder or do I need to mix a new batch every time? You can reuse it, but you may need to add a little more kalk powder to make up for what been dissolved and used. For best results, I recommend changing out your kalk about once per week. Most manufacturers discourage users from making more solution than can be used in one week. 8. How do I know how much kalk powder to mix with freshwater for my tank? How do I know if I am using enough/too much kalk? The simple answer is test your water. Monitor your calcium and alkalinity levels at a minimum while dosing kalk. Start with a lower amount dissolved (1/2 to 1 teaspoon per gallon) and monitor your tank’s parameters over the next couple of days. If you are seeing a drop in the calcium/alkalinity levels, increase the amount of kalk used; if you are seeing a rise in the levels (beyond the levels you are trying to maintain) decrease the amount used. 9. Are there any downsides or possible negative effects from dosing kalk? Due to the caustic nature of kalkwasser, it can cause major issues in your aquarium if overdosed. Specifically, it can raise your pH to dangerous levels. If you are dosing with a dosing pump or other automated system, you may want to use an aquarium controller to stop dosing in the event the pH level rises too high. 10. I have a nano reef—can I dose kalk? We generally do not recommend dosing kalk in nano aquariums. Changes in water chemistry occur more quickly in nano aquariums due to their small size and using kalk could lead to a dangerous pH spike. However, if you’re an experienced reefkeeper and feel dosing kalk is the best way to maintain your calcium and alkalinity, by all means proceed. My advice would be to try the minimum recommended amount first, if not slightly less. This will reduce the risk of dramatically altering your pH, which could have disastrous results in nano tank. Hopefully you’ve found this list of frequently asked questions useful. Of course, if you have additional questions about dosing kalk in your own tank, we are more than happy to offer you free one-on-one support to help you get started on the right foot. Give us a call, hit us up on live chat or send us an email: we’d love to hear from you!